A little more housekeeping here, just a roundup of my Valentine’s day menu from earlier this year. Each drink was paired with a small bite. I had attempted a Valentine’s menu in 2015, but the concepts never quite made it onto the blog. At that time, I had created early versions of the Love Letter and No More Cremes, but neither drink was fully developed until quite recently. Raspberry coulis à la Jacques Pépin, calvados, malic acid, rose air, raspberry powder, candied berries. Homemade chocolate liqueur, blood orange juice, citric acid, egg white, chocolate macaron with orange buttercream and candied orange. Buttermilk crème anglaise, demerara rum, whole milk, angostura bitters, tonka bean, caramel disk, doenjang caramel sauce, toasted brioche. This was a really great opportunity for me to focus on technique, as putting it together required me to make classic French sauces, fabricate a liqueur, prepare candied fruits, german buttercream, two different caramels, and a scented cocktail air. It was also another exciting opportunity to practice the art of writing a cocktail menu. Categories: modern drinks, original creations, spirituality | Tags: alcohol, angostura, bartending, bitters, booze, cocktail, cocktails, craft cocktails, drinking, drinks, infusion, liqueur, liquor, mixed drinks, mixology, molecular mixology, orange, raspberry, rum, valentines | Permalink. This is just a quick cut that I think is timely for the month of April. The Income Tax cocktail has a vague history that you can trivially find by searching for it on google. It’s a Bronx with bitters, which is to say, it’s a Perfect Martini with orange juice. I usually like to mix one up for myself on tax day, and that’s exactly what I did, plus or minus. The little hit of juice in this drink makes it much more refreshing than if it were pure spirits. You will find that the dry vermouth blends into the sweet vermouth, and then the sweet vermouth blends harmoniously into the orange, while the gin and bitters supply a solid bass note. Shake over ice and double-strain into a coupe. Do your damn taxes. Ultimately the exact ratios are up to you, but I like mine to be classically jiggered, and I like the orange juice in equal measure to the other supporting cast members. Categories: classics | Tags: angostura bitters, bitters, booze, classic cocktail, cocktail, cocktails, drinking, drinks, dry vermouth, gin, income tax, orange, sweet vermouth, taxes, vermouth | Permalink. Wrapping up my Valentine’s Cocktail Trio, I have a drink inspired by the classic French dessert, crème brûlée. They don’t want you to have craft cocktails, and that’s why it’s important to make them. For this drink I made a crème anglaise, and once again, I used my sous vide. This time, I adapted this Chefsteps recipe by cooking the mixture for 20 minutes at 82C, and then blending it until smooth. Originally I had used whole milk, as the recipe dictates, but the drink lacked a certain depth that can only come from proper acidity. In pursuit of acidity, I substituted whole milk for buttermilk, and this allowed me to develop a crème anglaise with a pleasant lactic tartness. This ingredient was nearly complete on its own, and required little adornment to become a fully realized drink. At first I tried shaking it with only demerara rum, but the drink was too thick; it was so thick, in fact, that shaking did nothing to aerate it. I wanted an airier texture and a lighter mouthfeel, so I ended up adding some 1% milk to lengthen it. It worked like a charm, allowing the shaken drink to hold some air bubbles and accumulate a pleasant froth. It’s important to use 1% here, because the drink is already quite rich with milkfat. The goal is to lighten the texture, so whole milk is not appropriate. I chose to use demerara rum as the base spirit for this drink because I wanted its caramel notes, which are right at home in a crème brûlée. To cement the theme and round out the caramel element, I garnished with a caramel disk. The imbiber cracks open the caramel disk with a small spoon (not pictured), much as one would a real crème brûlée. Many thanks to Johan for this idea. As with the Poison Yu, I grated a little bit of tonka bean on this drink, though I put it underneath the caramel disk, so that its aroma would only be released upon cracking the caramel. For the nibble, I served a round of toasted brioche drizzled with doenjang caramel sauce. Doenjang is a Korean fermented bean paste similar to miso, and it gives the caramel a savory umami note. I was inspired by my recent trip to a Shakeshack, where they were serving miso caramel milkshakes. I also topped the brioche with a bit of smoked salt. Shake and double strain, then top with grated tonka bean and a caramel disk. Serve with a small spoon. Arrange granulated sugar on a silpat and then slowly caramelize it into a disk with a propane blowtorch. This takes a little while, so do it ahead of time and store them wrapped in parchment paper in the fridge. Although this presentation was not as visually stunning as the other drinks in my series, for me, it was the most enjoyable to drink. You may have noticed that I used less alcohol in this one. When I jiggered it with a standard amount, it was slightly too boozy. I prefer to keep all of my drinks in a standard measure, but sometimes you have to break the rules. The formula is really just an adaptaiton of an old classic, Rum Milk Punch. They drink about the same way. I hope you had a happy Valentine’s day, or failling that, that you were able to drink away your sorrows. Categories: modern drinks, original creations | Tags: alcohol, angostura, angostura bitters, bitters, booze, caramel, cocktail, creme anglaise, creme brulee, dessert, liquor, milk, milk punch, mixed drink, mixed drinks, mixology, molecular mixology, rum, tonka bean, valentines | Permalink. Continuing with my Valentine’s Day Trio, course two was a preparation of the classic pairing of chocolate with orange. In this case, we made it two ways, once as a cocktail and once as a macaron. The macaron, pictured below, was a collaboration with my friend Johan, who was instrumental in designing this series. For the base of this drink, I used a cocoa nib liqueur, which I have made before, but which I have now updated with a modern technique. The diffusion of sous vide immersion circulators to home cooks has opened up many exciting new possibilities for those who wish to keep it craft. I made this liqueur in a mere two hours, by cooking 6 oz of cocoa nibs in 375 ml of vodka at 60C for ninety minutes. I then strained out the nibs and boiled them in simple syrup for a few more minutes. This is the classic alcohol+water extraction. I combined the syrup into the infusion according my palate, and allowed it to rest for three days. 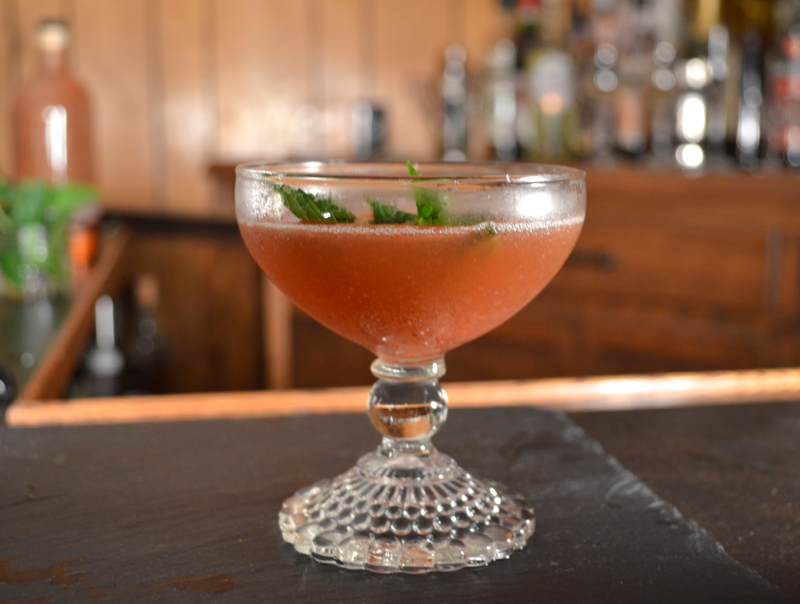 In this time, the flavors of the syrup and the alcohol will meld together, resulting in a much softer flavor. If you were to taste it immediately after combining, you would find a harsh ethanol note on the backend. This recipe, despite the fancy ingredients, is really just a take on Jeffrey Morgenthaler’s Amaretto sour. We combine a liqueur base with egg whites and an acidic juice, then use an immersion blender to emulsify the egg white. There is a small twist, however. Blood oranges, at the peak of their season right now, are not very acidic. They lack the acidity needed to form a stable foam out of egg whites, and as a result, they are not sour enough to balance a sweet chocolate liqueur. The answer to both of these problems is the same; powdered citric acid. 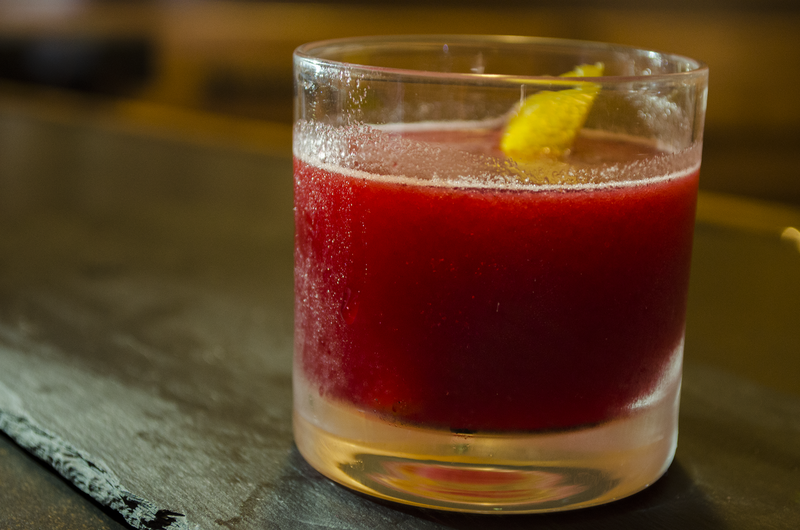 If you can master acidity, you can master cocktail creation. Acidity is the lynch pin of the drink, acidity is life. I slowly blended citric acid into my blood orange juice until it was approximately as sour as lemon juice. I am not going to give you a recipe for the macaron. You can figure out how to make macarons on your own, using many fine internet resources, such as Chefsteps. I will, however, provide a note on the buttercream. Johan and I made a German style buttercream by preparing a pastry cream sous vide. (82C for 35 minutes). The resulting product was too set up to use on its own, and we had to blend it in my Vitamix until it was smooth. We then incorporated the pastry cream into creamed butter, and mixed in some fine cut orange marmalade, some orange bitters, and some Clement Creole Shrub, one of my favorite orange liqueurs. In the middle, we placed a small chunk of candied orange rind, which we boiled in simple syrup for about half an hour. The candied orange provided a nice contrast of texture in the center of the cookie. To garnish the shell, we embedded some toasted cocoa nibs from Seattle’s own Theo chocolate company into the meringue. Emulsify with a stick blender and then shake gently over ice. Strain only with a hawthorne strainer into a cocktail glass and garnish by dropping chocolate bitters into the foam and then turning them into hearts with a toothpick. Serve with a chocolate orange macaron and a mandarin orange. Out of the drinks in the set, this one probably had the best reception, though I am quite proud of all of them. Categories: infusions, modern drinks, original creations | Tags: alcohol, bartending, bitters, cacao, cacao nibs, chocolate, cocktails, cocoa, cocoa nibs, craft cocktails, drinking, drinks, liqueur, liquor, mixed drink, mixed drinks, mixology, molecular mixology, orange, orange bitters, valentines, vodka | Permalink. I wanted to capture the feeling and the essence of the autumn season in a series of drinks that celebrate both its flavors and the colors. In that vein, I have continued to draw my inspiration from the Japanese concept of Shiki, which I learned at Bar Gen Yamamoto. This drink takes inspiration from the classic Bacardi Cocktail, which is a daquiri made with Bacardi and sweetened with grenadine instead of simple syrup. Long-time readers may remember that I have experimented with the idea of a cranberry daiquiri in the past, only at that time I preferred to think of it as a Rum Cosmopolitan. I have learned a lot since then, and I can say with confidence that this iteration of the concept is much more refined. The flavors are tight, complex, and yet easily approachable. Shake over ice and double strain into an old fashioned glass. Garnish with an orange peel. In some ways this recipe seems very simple, though one can find an opportunity for artistry. In this drink it lies not behind the bar, but in the kitchen. For the cranberry reduction, simmer cranberries in a bit of water until they are soft and falling apart, and then blend them into a puree and work them through a strainer. I did not measure this, though I did stir it. It is easily reproducible if you follow your sense of taste. Cooking the cranberries brings out their natural bitter, sour, and earthy flavors, which we wish to accentuate. A long and slow cook is ideal here, in order to concentrate the flavor. Too much heat will destroy it. Do not add sugar to the cranberries. We will find our source of sweetness in grenadine, which is made from fresh pomegranate juice. The pomegranate, like the cranberry, has a tart and earthy flavor, so it pairs well with the relatively naked cranberries, and saves the drink from being too one-noted. For the grenadine, I followed Jeffrey Morgenthaler’s method. It is stellar. I chose to omit the orange flower water in this drink, though I did garnish with an orange peel. The end result resembles a homemade cranberry sauce at Thanksgiving dinner. Preparing the drink is easy, but you will only have good results if you are attentive to detail when fabricating your grenadine and cranberry sauce. These things must be made according to one’s own good taste. I tried this with a variety of different rums, and I found that the best was the simplest. And although I did not prefer it, I was intrigued when I substituted a half ounce of the rum in this drink with El Dorado 3 Year. The caramel notes of the demerara rum add complexity, but for me they took away from the central flavor of the cranberry. Angostura bitters create a subtle spice note, to help impart a warming sensation in the cold of fall. Categories: modern drinks, original creations | Tags: alcohol, angostura, angostura bitters, bartending, bitters, booze, cocktail, cocktails, craft cocktails, cranberry, drinking, drinks, fall, grenadine, liquor, mixed drinks, mixology, orange, pomegranate, rum | Permalink. Ambience is important, of course, but the real meat of the matter, as always, is the menu, which I want to commend on several levels. 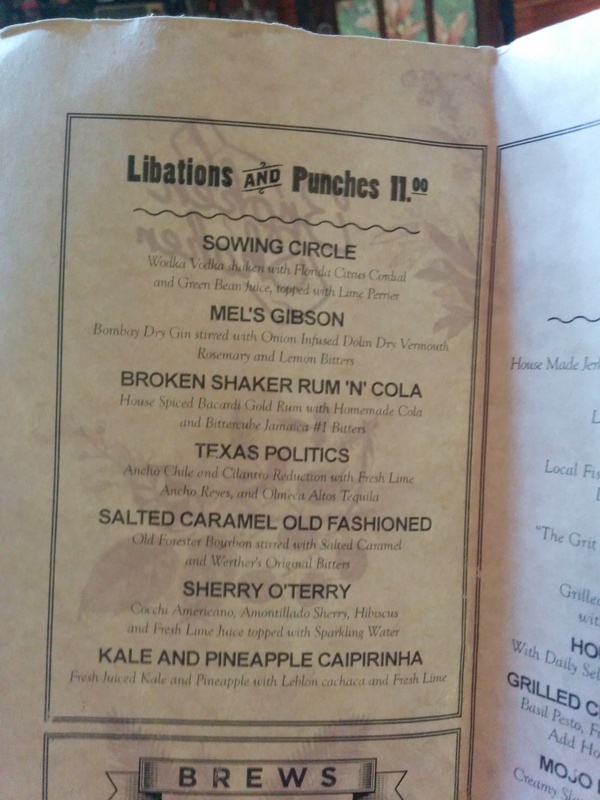 In the past I had the probably annoying habit of wanting to order off menu, but as I have spent more time developing cocktail menus for different events, I have really come to appreciate the thought and the effort that goes into creating a well-balanced menu. That said, many establishments simply do not invest the proper time attention when they create their menus. A good cocktail menu, as we have discussed, should be short and sweet. It’s better to have a menu with three excellent drinks than ten average ones. Moreover, too many choices will overwhelm customers and cause them to underrate their decision, regardless of what they order. The bar manager at The Broken Shaker not only delivered a menu that was tight and to the point, but also one with a good variety of interesting and creative drinks. Look at this beauty. I can honestly say that I would like to try all of them. Each drink has something different and interesting about it, and there is a good cross section of different flavors and styles. 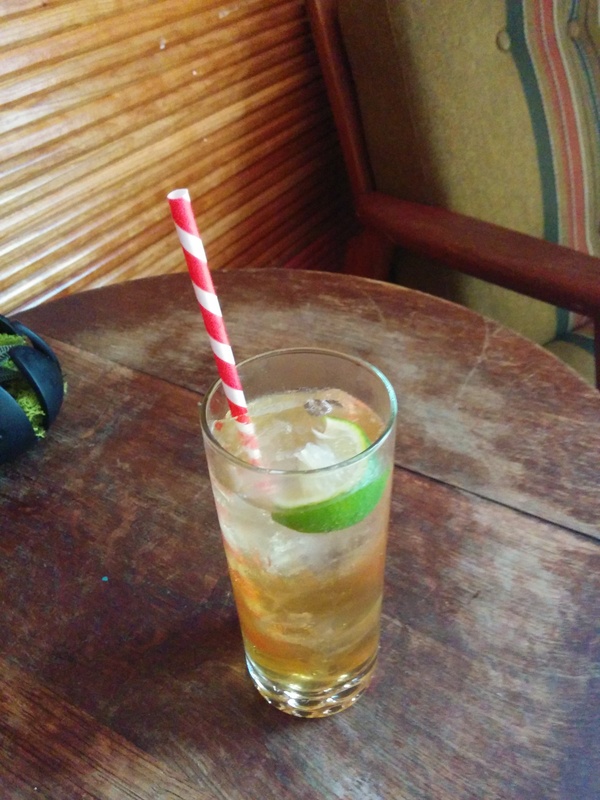 Unfortunately I was pressed for time, and I was only able to sample their rum and coke, which intrigued me with the promise of a house-made cola syrup. Observe the attention to detail in their presentation, which used a red and white paper straw. Their syrup was spicy and balanced, an excellent improvement on the more classic flavor of coca cola. The advantage to a home-made syrup like this is that it can emphasize the flavors of whole spices and fresh citrus botanicals from lemon, lime, and orange peel. The only disadvantage to this bar was that even at 3pm, they were packed. That’s a good problem to have, but it made me sad as I would have liked to grill the bartenders a little more about their techniques and philosophies. 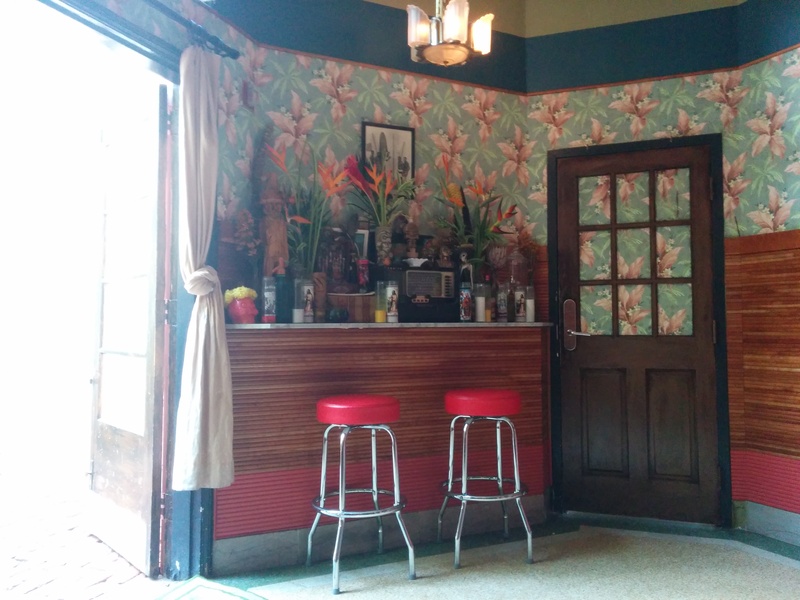 If you find yourself in South Beach Miami, definitely try to visit The Broken Shaker. 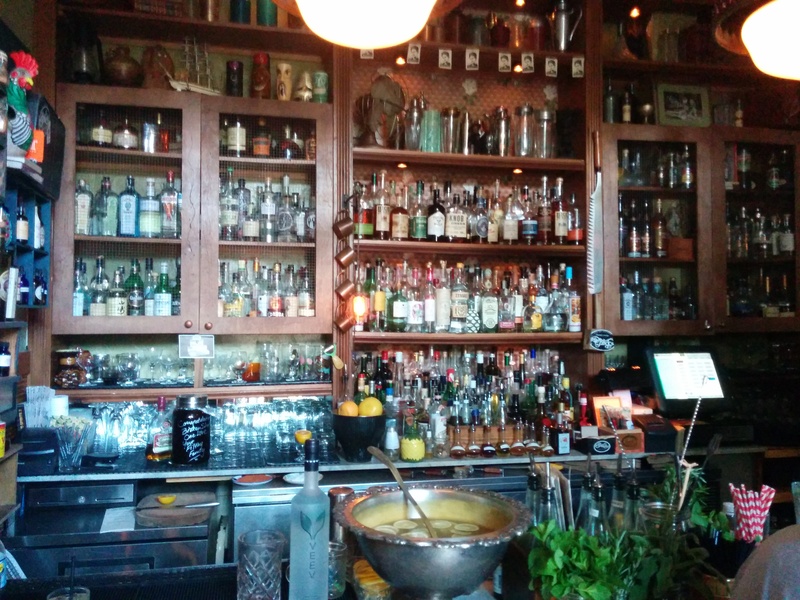 Categories: excursions | Tags: alcohol, bars, bartending, bitters, cocktail, cocktails, drinking, drinks, miami, mixed drinks, rum, rum and coke | Permalink.